In my last spinning post, Charleen asked about my comment on spinning angora. 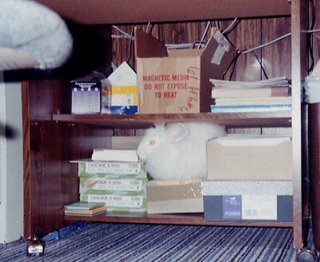 Having kept angora rabbits for about 6 years and having collected a seemingly lifetime supply of angora fiber from those rabbits, I thought I'd tell you the method I eventually came to use. 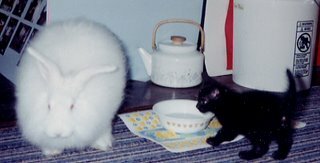 When I first learned to spin I never considered angora. What I really wanted was sheep. Unfortunately, we didn't live on a farm and didn't expect to any time soon, so DH agreed to give rabbits a try. 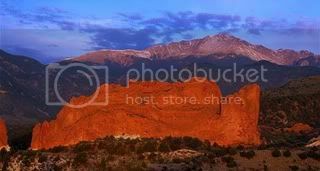 I started with just one (doesn't it always work that way ;) , but over the years was given three more. 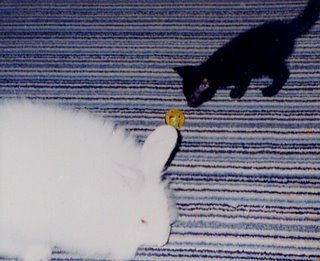 Rudy was a Ruby-eyed White French Angora. This is what albino angoras are called. He and Rascal were about the same age and got along very well together. A curious thing about the Ruby-eyed Whites is that evidently they can't see very well. When Rudy would look at you, he would stare while slowly weaving his head back and forth. One theory is that they move their head in an attempt to focus on whatever they're trying to see. 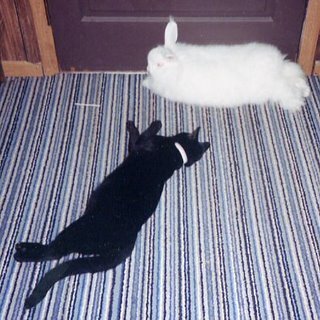 Rudy would have loved to have been a house rabbit. He loved to sit on my lap and be petted. 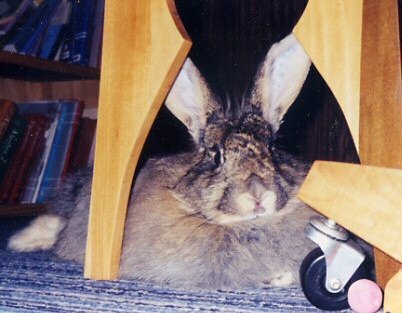 He loved to follow me wherever I went, constantly nudging me and hopping circles around me. He also loved to explore. And chew. At our house, 'my rabbit ate my homework' was a valid excuse. However, the very thing I got him for was the very thing that kept him in an outdoor hutch; his fluff. Actually this wasn't so bad. We didn't have air conditioning and angoras suffer more from the heat than from the cold. So he was more comfortable out of doors. Cricket was later given to me by a breeder who needed to find a home for her. She was a gorgeous French Angora Agouti, who had been been a successful show bunny. She didn't get along with Rascal as well as Rudy did. In fact, she didn't like Rascal at all. He would have been happy to make friends, but the first time she saw him she started grunting loudly and charged him. He kept his distance after that. Of course, she lived in an outdoor hutch and only came in for grooming and clipping. My last two bunnies were English Angoras. Smaller than the French Angoras, the English have long fiber on their faces and ears, making them a little harder to care for. Having less guard hair than the French, their wool is considered to be softer and finer. But that also meant that it matted more easily. This is Miss Ivy. She was given to me along with a small grey buck we named Tibber. They were given to me one winter by a couple who had wanted to raise meat rabbits and had somehow gotten ahold of them. They were matted from nose to tail when I first got them. Unfortunately I don't have a picture of Tibber, which I really regret because he had the sweetest, most loving personality of all my rabbits. Miss Ivy and Tibber both lived outside too. I kept this small hutch available for safety whenever they were in the house for awhile. Oh dear. I'm afraid I've spent more time reminiscing about my bunnies that talking about spinning angora. My apologies! 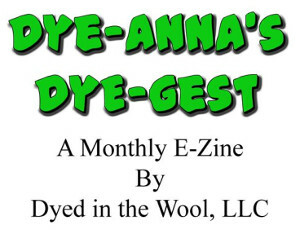 Next ...... All about Angora fiber. We used to keep angoras. Started off with 3 ended up with about 15. They're very hard work aren't they. Professional breeders keep them on wire caged floors to prevent their fur from matting, but we hadn't got the heart to do that, so grooming was a daily task. Would like to give it another shot one of these days. Do you still keep them? Yes, they are very high maintenance! 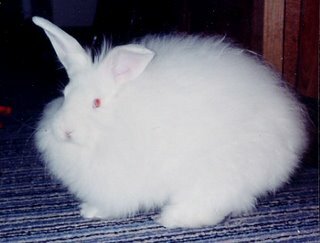 It is no wonder angora fiber is so expensive, especially since they don't produce all that much in a year's time. Sadly I no longer have bunnies. Over the years Rudy, Cricket, and Tibber crossed the Rainbow Bridge. I gave Miss Ivy away when we moved into town. I really do miss them. What sweet memories about your bunnies! Don't faint, I really didn't fall off the earth. Am taking my very first ever spinning workshop at the end of this month and am very excited. Up to now, I have tried with drop spindle (in my case should be called a 'throw spindle') and it has been a humbling experience. Now off to catch up on more of your posts! Jane! I have so wondered about you! Your blog has stood seemingly neglected for too long. So glad you are back. I can't wait to hear about your adventures. Right, so you've answered the question I had, how much maintenance does an angora require...lots....or else they turn into a matted-self-felting ball....guess we won't be having any of those for awhile! What cute bunnies! Rascal is cute too! Nice towels... I love woven towels and and will need to get The Best of Weaver's Huck Lace. 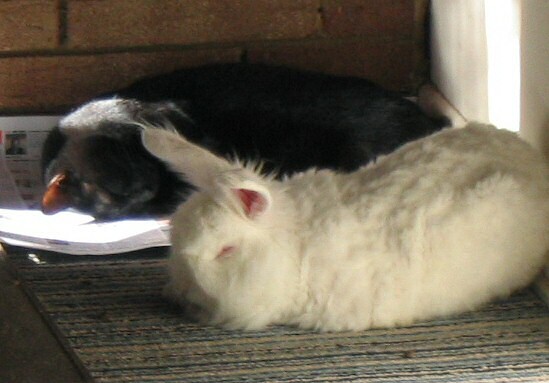 Leigh, it's been a pleasure to read about your bunnies, not boring at all! Awww, that was so sweet...I loved reading the bunny-biographies!